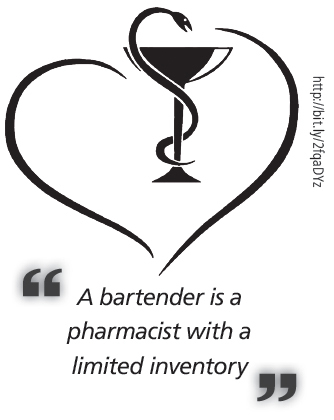 There is a famous saying in English about bartenders, and it goes like this, “A bartender is a pharmacist with a limited inventory.” Among bartenders, they consider themselves doctors who work at field hospitals where people can rest after their busy days. Although they cannot give prescription drugs, they can ease the pain of people with alcoholic beverages. 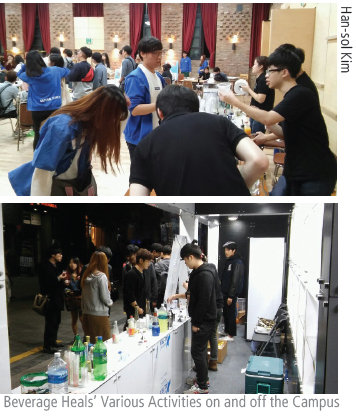 At the University of Seoul (UOS), there is a place where students can be trained to become bartenders. Beverage Heals, one of students’ central club, concerns cocktail making. The name of their club originated from the concept of the healing role of a bartender, and their motto is “focusing on the good function of alcohol and healing the mind and body with it.” The club doesn’t have a long history. In June 2013, a few seniors gathered together, enjoyed cocktails and shared their knowledge of alcoholic beverages. Back then, it was a provisionally-registered club, but this year the club was promoted to a central club, and it was the fastest promotion in central club history. 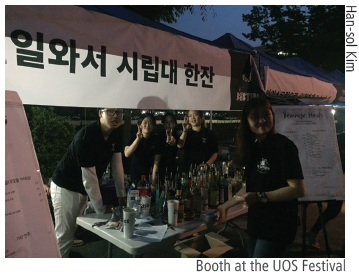 To know more about this fast-growing club, The UOS Times interviewed the president of Beverage Heals, Han-sol Kim (Dept. 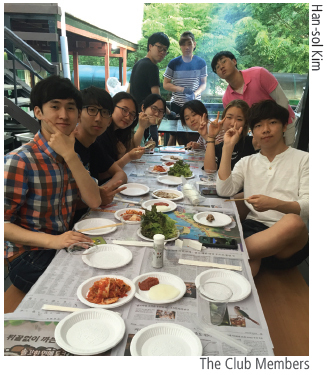 of Public Administration, ’12), and the vice president, Seong-jun Kwon (Dept. of Physics, ’15). Most of the time, school authorities strongly restrict the usage of alcoholic beverages in central clubs. 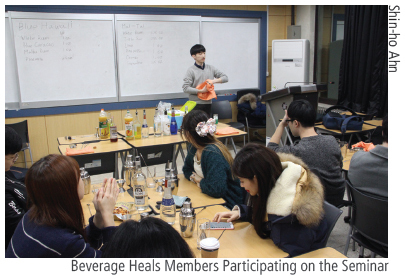 However, Kim said Beverage Heals is free to use them as an exception only during their weekly seminar, since their primary activity is “making cocktails.” The students in this club study cocktails and make them in elaborate ways, using alcohol beverages as instruments. According to our interview with Kim, the Heals is a brand-new club, so the relationship between seniors and current members is very intimate. For instance, many seniors who work as bartenders come to the weekly seminar, teaching practical experiences and giving lectures. From these lessons, the members of the club learn how to make beverages in more professional ways. The ability to use alcoholic beverages is not the only unique characteristic of this club. There is also a big difference between the Heals and other clubs in that club members can easily connect their hobby and future careers, if they plan to become bartenders. “In most clubs, it takes more steps to convert your hobby into your job, such as joining a pro league if you were part of a sports club. On the other hand, in Beverage Heals, you can choose your job in a bar-related field, because your club activity equals your career,” Kwon said. The club holds a seminar in a classroom at 7PM every Wednesday. During these seminars, the members take turns presenting cocktail recipes and interesting facts about them. While attending the seminars, club members study cocktail-making and learn about other alcoholic beverages as well, because the recipes contain different kinds of beverages. 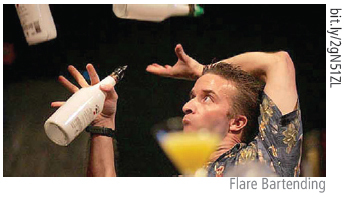 Some members also study for the Craftsman Bartender license, and others practice performance-bartending, such as flare bartending. Beverage Heals also participates in the various fairs and parties in and out of campus. For example, this club runs a booth at the annual school fair and sells cocktails at the Do Cafe party and homecoming parties of the colleges of UOS. In these activities, the members practice their skills and see the response of the customers and students at UOS, while making a profit for their club. The club’s current goal is “To Make Beverage Heals Bigger and Make Its Seminars More Professional,” Because Beverage Heals has a short history of only four years, it has only a few seniors and a small number of members. Therefore, they are planning to invite more professional bartenders to their seminars in the future and perform more cocktail-making skills by increasing their participation in activities outside of campus. The size of the club is also important because of the rather smaller size of the Heals, when compared with the cocktail clubs of other universities, and their low amount of funds. “We have a goal to make this club much bigger,” Kwon said, “Currently, we have about 30 members, and we will try to expand it to 50 members.” After practicing and expanding, The Heals’ final goal is to get an award from a renowned bartender competition. Some students might worry about over-drinking, but Kwon said that there is no pressure to drink because their purpose lies in “making beverages,” Kim and Kwon both strongly recommended a visit to the club and its seminars to students who are interested in cocktails. They also pointed out the misconception that cocktails are just for the rich and that they are unaffordable to drink. “Cocktail making is not hard or expensive, despite what many people think, so there’s no pressure on those who do it as a hobby,” said Kim. There are different stories and unique recipes for every cocktail, and some of them are even named after famous people, such as the Shirley Temple, which comes from a famous actress from the 1930s. 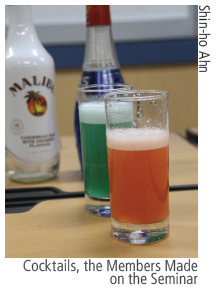 Kim and Kwon recommend a cocktail that have interesting histories and is easy to prepare so students can make it at home. Miners made it with basic ingredients using real screwdrivers after their work. 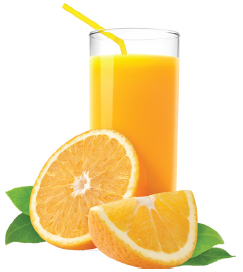 Mix vodka and orange juice (2 times more juice than vodka) in a glass filled with ice cubes. -Also called the “Lady Killer”, because it is easy to make and the taste of the vodka is not too strong, but it contains a high amount of alcohol.